In fact, even if you delete files from your hard disk, the data still remains and could potentially be recovered. You may say you also empty the Recycle Bin. Actually, the files hides on your hard disk somewhere and Windows only removes the entry from the FAT(file allocation table)so that the system does not see the file. These files can be found and recovered again as long as they haven't been overwritten by new data yet. But shredding is a process that will completely remove data from your computer. You cannot recover shredded files even hackers because the files has been overwritten with redundant data, and has been destroyed. 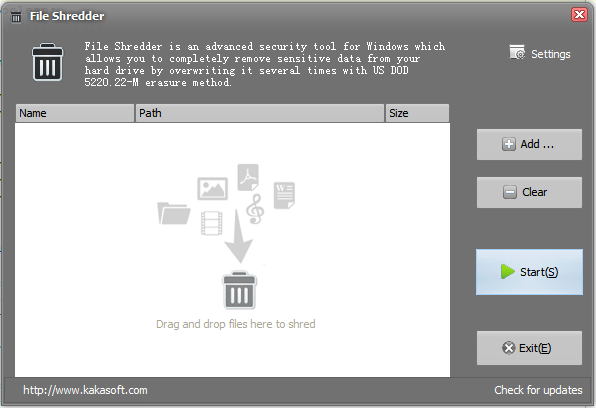 File Shredder offer secure erase features to permanently remove data. It’s a convenient, comprehensive solution to shred your files or folders. Below is a quick guide on how you can use File Shredder to erase files in your hard drive with few clicks. Follow these simple steps to protect your shared folder on network or on removable device with Shared Folder Protector. o Run the program and the Main Application Wizard will open. o Click ‘Add Folder’ button to add a folder to shred. You can also click "Add Files" button to add files. Step 2. Now click 'Start' button. All the files were shredded soon.